Jonathan Ward's latest masterpiece out of the ICON factory is a classic five-window pickup. While it made its first appearance at SEMA a few months ago, it's just so darn pretty we had to give it some attention on Truck Yeah! "I restored a half dozen of these, and they all sucked to drive." Ward told Wired. But he loved the shape, and was keen to add an element of on-road performance to the ICON lineup. After laser-scanning a standard Thriftmaster and uploading it to CAD through the same technology used in CGI, Ward and his team began design the trim pieces ICON made their name on. He describes them as "geek out details." The original Thriftmaster 3100 was built from 1947 to 1953, and were number one in sales for every year they body style existed according to truck historian Don Bunn. ICON's version will be somewhat more exclusive, with a production run of just five for 2014 and a price range between $230,000 and $250,000 depending on the transmission and forced induction setup. Standard engine is a GM 5.3 small-block V8 making 315 HP, a Magnuson supercharger that boosts output to 435 HP is optional. All ICON Thriftmasters will be "loaded" with the same features; LED lighting, power windows, touch-screen infotainment, bison hide seats, and a mobile WiFi hotspot. True to ICON's ethos, the modernities are neatly tucked away and integrated seamlessly into the retro design. The screen is hidden behind a dashboard plate when not in use, and even the window controls are disguised as cranks. Between the chrome, leather, and trimwork, the interior is more Restoration Hardware than AutoZone. Adam Carolla pointed out the irony of leaving the name "Thrift" on a quarter-million dollar vehicle, to which Ward asserted the name was retained from the base vehicle's engine series, adding "I liked the font." No wonder he and Jason got along so well. 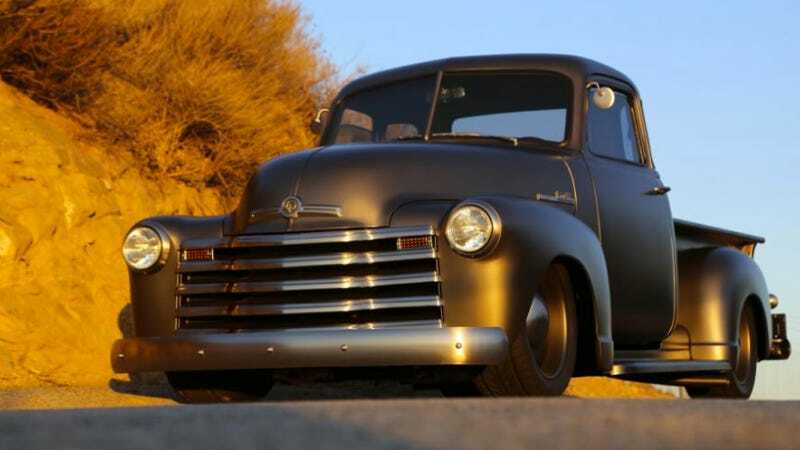 The chassis is unique to ICON, designed and built by renown vintage Chevrolet tuner Art Morrison who Ward considers a personal hero. Modern independent front and four-link rear suspension help transform the experience behind the wheel. Despite a shape that's classic "truck," the low stance and 2WD layout make this the closest thing to a car that ICON has produced yet (as a line) and may be indicative of where Ward wants to take the company next. For more details and images, ICON's Thriftmaster page has the complete rundown and Mr. Ward's personal phone number for any questions you might have.